Meal prep your breakfasts for the week! 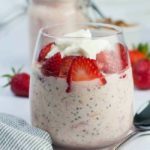 Make these Creamy Strawberry Rhubarb Chia Overnight Oats the night before and wake up to a nutritious breakfast! True story: I think about breakfast when I head to bed at night. And this week, I’ve been eagerly anticipating these little jars of smooth and creamy, naturally sweetened oatmeal ready and waiting for me first thing in the morning! 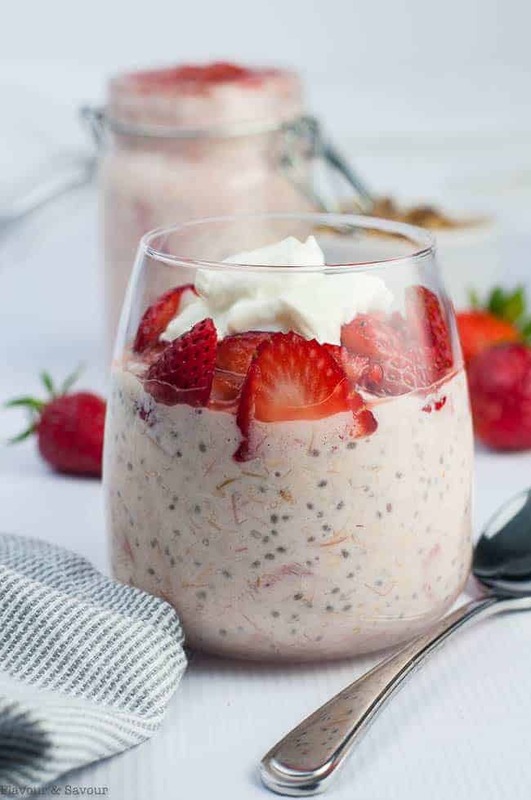 These Strawberry Rhubarb Chia Overnight Oats are a cheerful way to start my day. No effort required, and they’re just so pretty! Overnight oatmeal, oatmeal in a jar, Mason jar oatmeal, refrigerator oats, no-cook oatmeal: no matter what you want to call it, this recipe is a great way to make sure you’re getting a nutritious breakfast on those days when you’re feeling rushed. Having prepared my breakfast the night before makes for stress-free mornings. Soaking oats softens them, making them digestible and there’s no cooking required. 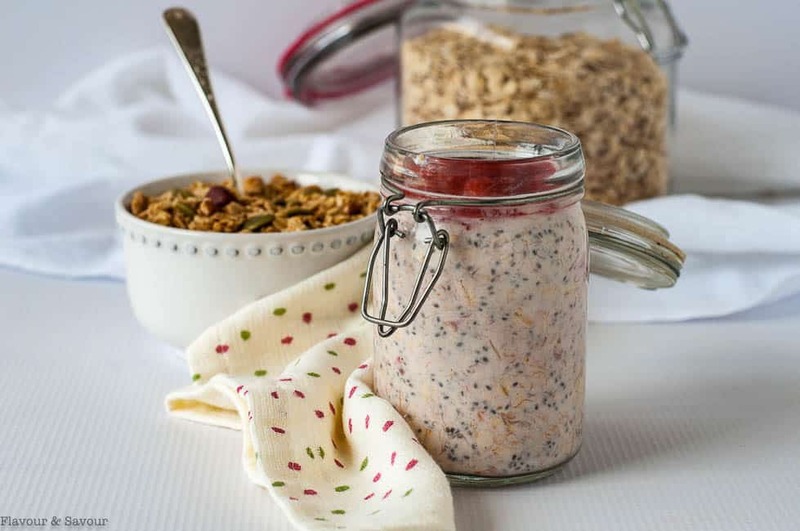 To make this healthy make-ahead breakfast, measure rolled oats into 8-ounce Mason jars, jars with hinged lids, or dessert glasses. Add probiotic-rich Greek yogurt or thick kefir and your choice of milk, dairy or plant-based. Add protein-rich chia seeds, and stir in a little maple syrup. Top it all off with strawberry rhubarb compote. Cover and let tomorrow’s breakfast work its magic in the fridge overnight. 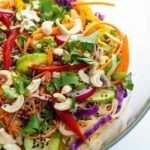 The chia seeds will soften, making them easy to digest. In the morning, you’ll have sweet, creamy delicately pink oatmeal! 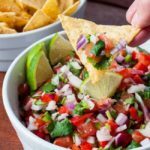 You can either eat it cold, straight from the jar, or pour into a bowl and heat in the microwave or in a saucepan on the stove. Garnish with fresh strawberries, an extra dollop of Greek yogurt or a spoonful of crunchy granola. Make a double batch and have breakfast ready for the week! When you think of strawberry-rhubarb, does strawberry-rhubarb pie or strawberry-rhubarb crisp come to mind? 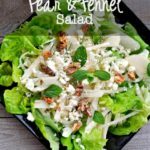 While those may be the most common ways to enjoy this favourite flavour combination, there are so many more recipes to try! 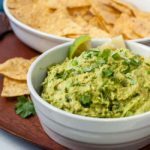 While oats are naturally gluten-free, if they are processed in a facility that also processes other grains, there is a danger of cross-contamination. If you have celiac disease, you might choose to purchase certified gluten-free oats which are processed in a dedicated and certified gluten-free oat mill. Love rhubarb? Try these recipes: 10 Ways to Use Rhubarb that Aren’t Pie. 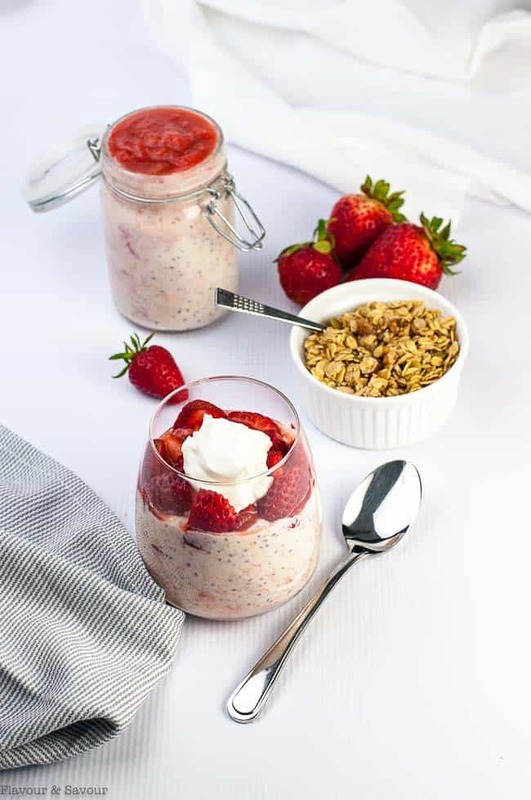 A jar of naturally sweetened creamy Strawberry Rhubarb Chia Overnight Oats makes a nutritious breakfast that you can make the night before. Double the recipe and make breakfasts for a few days! Add 1/4 cup rolled oats to each of 2 jars. 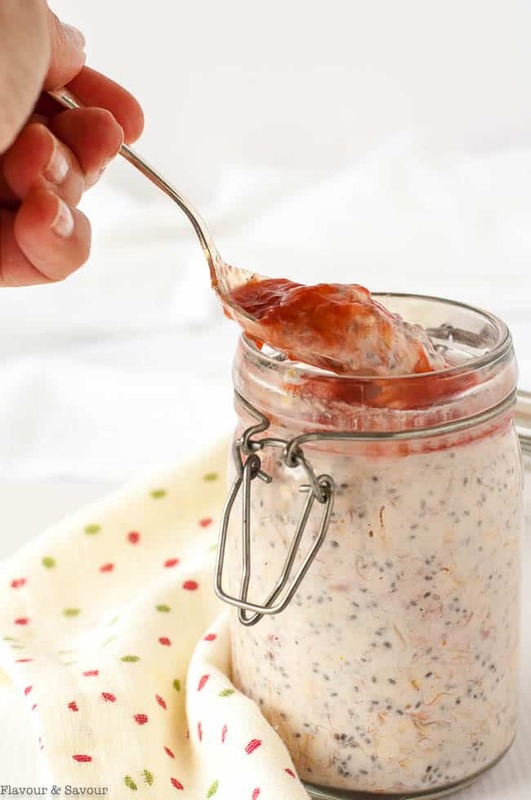 Top each with 1/4 cup Greek yogurt (or milk kefir), 1/4 cup milk of your choice, 1 1/2 tsp chia seeds, and 2 tbsp rhubarb compote. Stir. Top with remaining rhubarb compote. Refrigerate overnight or for at least 4 hours. Eat straight from the jar, or transfer to a bowl and heat in the microwave. Garnish with fresh strawberries, a dollop of yogurt and a spoonful of granola, if desired. Stir chopped rhubarb, water and maple syrup (or honey) in a large non-reactive pot. Bring to a boil, then reduce the heat and simmer for 10 - 15 minutes or until rhubarb is tender. Remove from heat. Mash, or use an immersion blender or pulse in a food processor to purée the rhubarb. Add the finely chopped strawberries. Store in a glass jar in the refrigerator. Note: you only need 1/2 cup of this compote to make overnight oats. 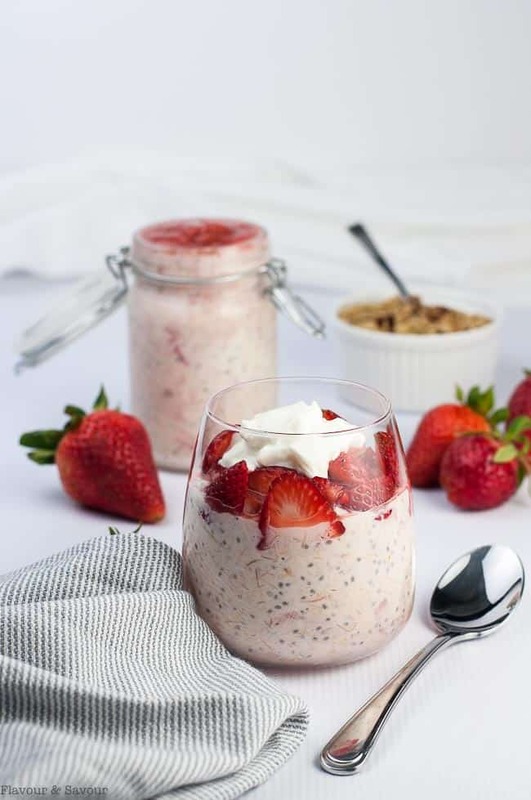 Use the remainder in this Strawberry Rhubarb Smoothie, Paleo Strawberry Rhubarb Coffee Cake, Rhubarb Bellini Prosecco Cocktail, or in this Skinny Strawberry Rhubarb Breakfast Parfait. Make it vegan! Substitute coconut milk yogurt and use a plant-based milk. Thank you, Elaine. Can’t wait to try this! One more way to use up that yummy rhubarb! This looks super creamy Elaine. 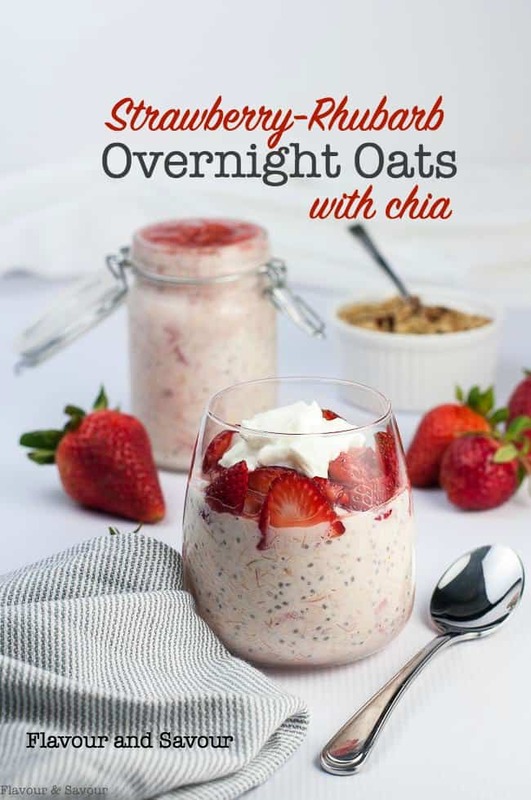 I always add chia to my overnight oats. It just makes it that much more filling. And I love the rhubarb addition! Another healthy breakfast idea to pin! !